Photographic works of Frank Dituri, photography instructor in the LABA Academy of Art in Florence, Italy, will show Jan. 31 through March 17 at The Cole Art Center @ The Old Opera House. NACOGDOCHES, Texas - The color photography of Frank Dituri will be exhibited Jan. 31 through March 17 in the Reavley Gallery of The Cole Art Center @ The Old Opera House, Stephen F. Austin State University's historic downtown art gallery. "Frank Dituri: Il Sacro." (The Sacred) features photographs the artist took in Italy over the past few years. Dituri teaches photography at the LABA Academy of Art in Florence, Italy, which shares an exchange program with SFA's School of Art. Students at both institutions visit each other's campuses and communities and benefit from collaborative artistic projects. The exhibition opens with an artist's talk at 5:30 p.m., followed by reception at 6 p.m. Thursday, Jan. 31, upstairs at Cole Art Center. 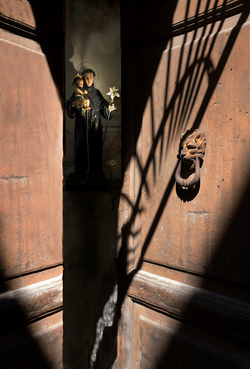 David Lewis, professor of art history in the School of Art and curator of the exhibition, describes the collection of photographs as "an exploration of spirituality." "In the exhibition, the artist continues an ongoing personal exploration of spirituality in digital photography," Lewis wrote in a show description. "The images are derived from visits to churches and chapels and such less obviously sacred spaces as side streets, alley ways and wine cellars." Lewis said a sacred place may be understood as anywhere a person might have an experience of a strong spiritual or religious nature - suggesting the presence of a divinity, or what theologians call "the numinous." "Such 'Holy Ground' can be manifested in the physical world around us, or as Dituri's works reveal, a place that largely exists in the mind," according to Lewis. Dituri uses various strategies to create a sense of a numinous presence, most powerfully through the way he essentially implies rather than depicts that presence, Lewis said. He often positions the holy presence out of view, implying it with cast shadows or light emitted from beyond a doorway, or from around a corner at the end of a hall or an alley. Doorways lead into other rooms, and windows provide only glimpses of sky or landscape. In other, more literal works, his statues of holy figures sometimes seem to be peering back at the viewer from behind a partially parted curtain, and at other times, the viewer seems to be looking over someone else's shoulder, trying to get a better view, Lewis explained. "This anticipation of coming closer to a supernatural force - a mysterious presence - gives Dituri's work great power," Lewis said. "His trance-like works are also hauntingly beautiful." The exhibition and reception are sponsored in part by William Arscott, The Friends of the Visual Arts, Nacogdoches Junior Forum and the Flower Shop. Admission is free.